The simplest solution is often the best. This old adage applies to almost anything, including dimensional inspection. In a room full of high-tech equipment like 3D scanners, coordinating measuring machines, and high-precision devices that can measure on a nano scale, sometimes the only thing really you need is a pair of calipers. Dimensional inspection hand tools are sometimes the best answer when you need to take measurements. They are both portable and precise, are generally cost-effective, and they can be used for a broad range of applications. Calipers - There are several different types of calipers designed to measure length, depth, internal, and external dimensions. Calipers can also be used to transfer dimensions from one object to another. Bore gages - Take an internal diameter measurement or compare to a pre-determined standard. Fixed gages - Used only to compare an object to a standard, fixed gages can measure attributes such as angle, length, radius, bore size, thickness, and other parameters. Micrometers - These dimensional inspection hand tools can use mechanical, digital, laser, dial, or scale technology to precisely measure length, depth, thickness, diameter, height, roundness, or bore. Protractors - Measure angles with a variable protractor or compare the angle of an object to a standard with an angle gage. Indicators and comparators - The precision movement of a spindle or probe is amplified so the results can be displayed digitally or on a dial or column. Air metrology instruments - Thickness, depth, diameter, roundness, taper, and bore can be measured by calculating changes in pressure or air flow. Ring gages - Typically used as a pass/fail test, ring gages can be threaded, smooth, or tapered to test the size of pins, threaded studs, and shafts. Length gages - Electronic or mechanical, these devices are used to measure or compare the length of an object. Thread gages - The spacing, shape, size, and geometry of a thread can be verified or measured with a thread gage. Although dimensional inspection hand tools are frequently a simple and elegant solution, they still must be treated with the same care as a machine that uses more advanced technology. Some devices must be calibrated or regularly cleaned to ensure that they provide consistent, accurate results. It is also important that the operator is appropriately trained to prevent human error. Whether you have a simple measuring problem or a complex quality control requirement, come to Q-PLUS Labs for all of your dimensional inspection needs. 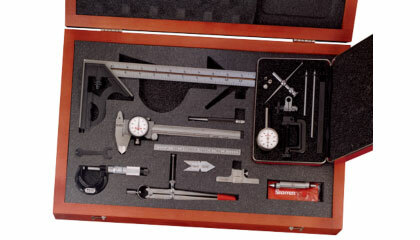 We'll help you select the right equipment and either train your staff to use it or perform the measurements in-house. Want to learn more about selecting the right dimensional inspection equipment for your application? Download our free e-book today. Which dimensional inspection hand tools have you used?